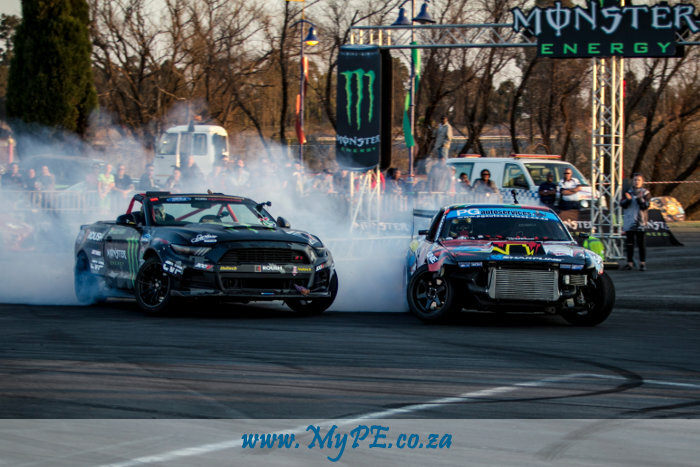 Paolo Gouveia (championship leader) tandems against Jason Webb in his furious ‘Monstang’ at SupaDrift 03 recently held at Carnival City, Boksburg. Photo: Darren Townsley. The SupaDrift Series hair-raiser event is upon the doorstep of Nelson Mandela Bay and certainly knocking hard – if you happen to open it – expect the rumble of V8’s, the turbo whine of high revving rear-wheel drive machines and moreover, the blaze and burn of the smoke cloud as after effect of tyre shredding sideways madness… Next weekend, Saturday the 29th July, all eyes will be on the Aldo Scribante Race Circuit in Port Elizabeth as the best of SA drifters arrive in the friendly City to do ‘unfriendly’ battling in the national drift championship. Drivers will qualify and then as they progress through the ladder of the days event; the door-to-door antics get closer and closer in the head to head tandems. It certainly is a get set drift-off and again, a perfect chance to watch driftsperts make the corners sing to the tune of interconnecting turns whilst maintaining ‘the drift’, a criteria the SupaDrift judges will keep a close eye on. “I cant wait to get to PE, we were there last in 2015 and much has changed in the drift circles of SA; I believe that more entertainment and closer battles will be par for the course at this years event, which will certainly keep the crowds on the edge of their seats”, says Mikey Skelton, organiser of the fast growing Series. Following his win at the last event, Jason Webb, driving his newly built “Monstang” – Monster Energy Ford Mustang, 700Hp plus, will similarly be calling for support from his followers as he pushes for a place on the podium as well as the opportunity to work himself up the ladder of SA’s Drift Championship; but drivers like Jim McFarlane, driving a Chev V8 Achilles Tyres Nissan 350Z has other plans for his compatriot, as does Championship leader, Paolo Gouveia, hailing from KZN in his Prepsol sponsored Nissan S13, who adamantly states, ”Its one of the fastest and best circuits to race on and certainly a blacktop that crowds can get close up near the action and this is what will motivate the drivers even moreso as they can hear the applause and cheers of the locals, I am ready!”. Tickets are available at the door – R100 for adults and R50 for children under 12 yrs. Date: 28-29th July 2017, Aldo Scribante, Port Elizabeth. For more information visit www.supadrift.co.za or follow the Series on Facebook.